Combine the ingredients (giving the rosemary a rub to release the essential oils). Place them evenly into the Acquablend basket. 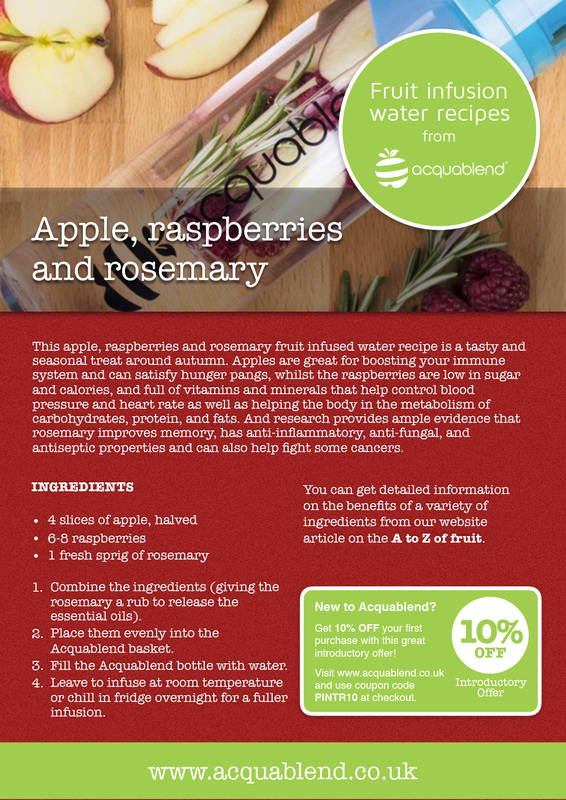 This apple, raspberries and rosemary fruit infused water recipe is a tasty and seasonal treat around autumn. Apples are great for boosting your immune system and can satisfy hunger pangs, whilst the raspberries are low in sugar and calories, and full of vitamins and minerals that help control blood pressure and heart rate as well as helping the body in the metabolism of carbohydrates, protein, and fats. And research provides ample evidence that rosemary improves memory, has anti-inflammatory, anti-fungal, and antiseptic properties and can also help fight some cancers.